The nervous system, the endocrine system, and the immune system are inextricably linked, like a three-legged stool. Numerous research studies have shown that chiropractic care positively impacts immune system function. 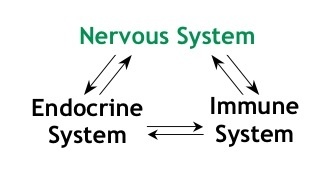 The nervous, immune, and endocrine systems share tiny messenger molecules that mediate communication between them. One of these messenger molecules, IL-2, used to be classically thought of as an immune system molecule; however, studies published within the past decade have clearly shown IL-2's presence and activity in the nervous system. One recent pioneering study, "Enhancement of in vitrointerleukin-2 production in normal subjects following a single spinal manipulative treatment" clearly demonstrated an increase in IL-2 levels and also in the function of T-cells, which are key players in the immune system's army of cells, following chiropractic adjustment. The authors concluded that chiropractic adjustment can influence the biological immune response. In another elegant study by Selano et al, "The Effects of Specific Upper Cervical Adjustments On The CD4 Counts of HIV Positive Patients'" (Chiropractic Research Journal 1994; 3(1): 32-39), the effects of six months of regular chiropractic care on the immune system function of HIV patients was measured. At the end of six months of care, the patients who had received regular adjustments had a 48% increase in the number of CD4+ T cells (p=0.06), whereas the patients who were not adjusted had an 8% decrease in CD4+ cells. A series of studies published in the Journal of Manipulative and Physiological Theraputics (JMPT) by Brennan and Triano showed that several types of immune system cells, including phagocytes, neutrophils, and PMNs, showed increased biological activity after chiropractic adjustment. These studies all suggest that chiropractic adjustment can enhance immune system function. And let's not forget that the endocrine system is the third leg in the stool of neuro-endocrine immunology. The endocrine system's main players are epinephrine (also known as adrenaline), nor-epinephrine, and cortisol. These molecules are produced in the adrenal glands, endocrine glands which have direct connections with the nervous system by way of a division called the sympathetic nervous system. Cortisol in particular is a stress hormone that inhibits the immune system (which is why stress really can make you sick!) So if the sympathetic nervous system is too "turned on" due to stress and subluxation, it can increase the adrenal glands' synthesis of cortisol, in turn affecting the immune system. Subluxation promotes this exact situation. Chiropractic care is the only way to detect and eliminate subluxation. If you or someone you know always seems to be sick, subluxation could be at the root of the problem - and the only way to find out, is to have your spine checked!